Privately, Harrington was “stunned” by Nick Faldo’s decision to leave Darren Clarke out of the side to face Paul Azinger’s warriors in Kentucky. But even after suffering two crushing blows on the opening day, when he emerged from epic foursomes and fourball encounters with Phil Mickelson and Anthony Kim with just half a point, he put the team ahead of his personal disappointment. US skipper Azinger was quick to pay tribute to the Dubliner, who holed putt after putt in his foursomes partnership with a misfiring Robert Karlsson to leave Kim and Mickelson on the verge of defeat and then repeated the trick in an amazing fourball clash with the American pair in partnership with Graeme McDowell. That the Americans came back from three down with six to play to earn a half and repeated the feat to beat Harrington and McDowell in the fourballs, was a tribute to the dynamic duo that has been dubbed Batman and Robin by the American media. As Azinger explained: “Mickelson and Kim actually played terrific. 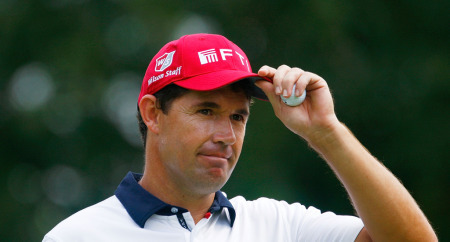 I think when you look at that match, you have to actually take your hat off to Padraig Harrington who was just remarkable on the greens. He made one key putt after another after another. In the afternoon fourballs, Harrington and McDowell cruised into a three up lead after four holes in what will be remembered as one of the great Ryder Cup matches. But the Americans hit back with incredible viciousness, firing 10 birdies to eight by the Irish pair for a 2 up victory. Kim’s over the top celebrations drew criticism in some quarters. But Harrington showed the kind of sportsmanship in defeat that would have made his late father Paddy, the hard-nosed cop, a proud man. “I thought it was nice, Anthony, young fellow like that, he was enjoying it and it was good to see,” Harrington said. “You get older, you don't quite get into that, but it was good to see the excitement in him. “I'm old in the tooth now. I just play a different game. I obviously just do my own thing all day and I try not to get high and low. I try and keep it very even tempo all day, and that's just the way I go about it. “But you know, I don't think Anthony is that type of guy. You know, he wears his heart on his sleeve and he showed it today, and it was nice, as I said, you could only admire the fact that he was wanting to play the Ryder Cup. We've pushed the U.S. guys into wanting this very badly. Europe has to take credit for that." Harrington will never get as excited as he was at Brookline in 1999, when he stared down the 1998 Masters and Open champion Mark O’Meara to win his rookie singles encounter. But while O’Meara had had a year to recover from his double major winning 1998 season, Harrington arrived in Kentucky feeling mentally shattered. Having missed the cut in the first two FedEx Cup events, it was no wonder he sounded exhausted on Friday night after finishing a marathon day with just half a point to show for it. He said: “I'm tired. I'm real tired. Put a lot of energy into getting a half a point today which is a lot of work. There is no doubt that Harrington is a different animal to the enthusiastic 28-year old that turned up at Brookline in 1999. He is now a Major player in every sense of the word and that creates a problem in an event like the Ryder Cup, where attacking golf trumps the safety first approach that has become Harrington speciality. The Dubliner knows that despite his three major wins, he is no Tiger Woods when it comes to the intimidation factor, explaining: “I don't think the guys are scared, when they step onto the first tee to play me. Individual glory in a team event counts for nothing for Harrington and he will take no pleasure from finishing the week at Valhalla with a decent haul of points if Europe loses. He said: “I want to win the Ryder Cup as a team. Individually it doesn’t come into it. We all like to go back over Ryder Cup records and say this that and the other but at the end of the day its whether the team wins or loses. “A player can go into the Ryder Cup and he might not get points on the doors himself but by saying and doing the right things, by responding to his fellow teammates he might encourage them and they might get the important or crucial points. “That can often be said of a player who wins five matches. He can be a destructive element in the team and cause other players in the team to be unhappy and not play well. In the week of the Ryder Cup we want a winning team and it’s all about working towards that. Padraig Harrington celebrates his 39th birthday today giving thanks that he’s a Ryder Cup golden oldie.